Adventurer Robert Cornuke has produced a new video which claims that remnants of Noah’s Ark have been found in the Elburz Mountains about 54 miles from Tehran, the capital of Iran. Cornuke is founder and CEO of the Bible Archaeology, Search and Exploration (BASE) Institute of Colorado Springs, Colorado. In 2005 and 2006, Cornuke and select volunteers, visited Mount Suleiman in the Elburz Mountains looking for an object they suspected might be the remains of Noah’s Ark. Prior to his claims about Mount Suleiman he was convinced that the Ark had landed on Mount Sabalan in Iran (Cornuke and Halbrook 2001). After his third trip to Iran in 2006 he posted articles on his website detailing the reasons why he thought Noah’s Ark might have landed on Mount Suleiman, northwest of Tehran in Iran (some have since been taken down). Cornuke’s claims have been examined and reviews posted on the web and by multiple authors . At the end of the reviews Cornuke was challenged to publish his findings from Mount Suleiman in a scientific peer-reviewed publication but none have been forthcoming. Cornuke, while couching his claims in careful language, maintains that he has discovered the true Mount Sinai, the actual anchors from St. Paul’s shipwreck, the location of the Ark of the Covenant, and now Noah’s Ark in Iran (2005). Now this material is available in a slick new video, the subject of this review. Since evidence and claims are being made in this video which we believe do not establish the case that Noah’s Ark has been found, or that it could have landed in Iran, and because of the excellent production quality, we are concerned once again that its sensational claims will mislead the Christian public. The video begins by arguing that Genesis 8:4 does not specifically state that the Ark of Noah landed on contemporary Mount Ararat in Eastern Turkey. That this Scripture only gives us a general location of the Ark’s final berth is one of the few points in the video with which we agree. The main premise of the video, as stated on the back cover of the video box, is that: “Based on the testimony of the Bible, personal investigation, examination of evidence, and other factors, Cornuke points to Mount Suleiman in the modern-day country of Iran, as the most probable resting place for Noah’s Ark.” This premise, however, collapses on Biblical grounds and other known facts. Let’s look briefly at each of these assumptions. First, the main reason Cornuke began his quest to find Noah’s Ark in Iran, is based on the testimony of a World War II soldier who claims he was shown the Ark in 1943. In fact, we would be so bold as to say that without this testimony we sincerely doubt that Cornuke would have ever traveled to Iran. The soldier in question, the late Ed Davis of New Mexico, claimed that while stationed in Iran with the Army Corps of Engineers he was shown the sites of the Garden of Eden and Noah’s Ark (Shockey 1986). Ark researchers, including the authors, have spent many hours analyzing this testimony (Crouse 1988; 1989; 1993). The story he tells is riddled with contradictions and puzzling problems. For example, in his earliest testimony he indicated he was stationed in Hamadan, Iran, (Persia at that time) and because of a favor he did for his friends, they took him to the Garden of Eden and Noah’s Ark. In the very first recording of his testimony he noted that his native friends were Lurs or Lourds, a predominant ethic group in western Iran (Luristan) near the Zagros Mountains. However, zealous Ark researchers corrected him that they were Kurds since they are the major ethnic group in the villages at the base of Mount Ararat. Hence from then on Davis calls them Kurds. In subsequent debriefings, Ed noted other details such as the fact that he and his friends went through the town of Qazvin on their way to the mountain, and that he could see the lights of Tehran from the Ark’s site. It was these two facts that led former detective Cornuke to conclude that Ed must have been somewhere in the Elburz Mountains north of Tehran. Cornuke and remote-sensing expert Ed Holroyd then began looking at satellite data of the Elburz Mountains to find a configuration of canyons that matched Ed’s detailed description. They concluded that just such a formation existed on Mount Suleiman. In 2005 Cornuke made his way to Mount Suleiman and found a large black rock extrusion he came to believe was what Davis was shown. What we find interesting is that while Cornuke believes he’s found the Ed Davis object he does not tell his viewers the whole story. Davis also declared that the Ark was broken into two pieces and that you could see compartments inside. Because of the hollow nature of the Ark, he claimed that his friends had shown him artifacts that fell out of the broken Ark including lentils, beans, honey, hay, feathers, nuts, dried fish, oil lamps, tools, clay vats, petrified shepherd staffs and petrified woven twig doors! Davis and his guides viewed this “Ark” object from the edge of a cliff and were planning to use ropes to get down to it the next day. None of this description is shared in the documentary, nor does it square with the object shown in the video. There is no cliff and no “compartments” and no artifacts shown at this rock outcropping in the video. Most Ark researchers, however, do believe Ed Davis did have some kind of experience; his friends probably did show him something as he noted in the flyleaf of his Bible. Interestingly enough, according to Lur tradition (and Ed Davis’ friends were Lourds) both the Garden of Eden and the final resting place of the Ark are in the region of Luristan. According to Major Henry Rawlinson, the Lur tradition puts the Ark’s final resting place on a mountain called Sar Kashti, a mountain in the Zagros mountain range of Western Iran about a day’s drive from Hamadan (1839: 100). The second major problem with the Cornuke thesis is that there is no evidence yet discovered that indicates the region of Urartu/Ararat ever extended as far north and east into Iran as he claims. In fact, in the video, Cornuke’s map doesn’t even cover the ancient capital of Ararat/Urartu on Lake Van! This is a grievous error. What is at stake here is the inerrancy of Scripture. As far as these authors are aware, no Urartian scholar would put the Kingdom of Urartu as far to the east as Cornuke claims even at the height of its empire in the 8th and 7th centuries B.C. At the most, it extended only a few miles south and east of Lake Urmia. Most scholars are in agreement that when the author of Genesis referred to the mountainous region of Ararat in Gen. 8:4, he was making reference to the region directly north of Mesopotamia, centered around Lake Van (Zimansky 1998: 2). The tribes and regional kings of Ararat (Urartu) are first mentioned in Assyrian literature in the 13th century B.C. meaning it could easily have been in existence and known by Moses (Zimansky 1998: 6). The Urartu archaeological map is extended with more labels from noted Urartian archaeologist Boris Piotrovsky, who was Director of the Hermitage Museum in St. Petersburg and directed the Urartian excavations at Karmir-Blour, one of the greatest fortresses of Urartu (1969: back cover). 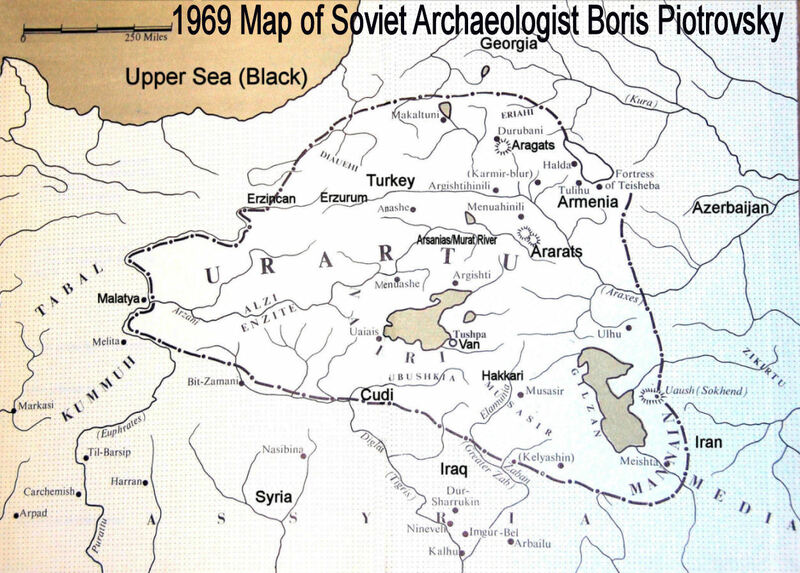 In order to accurately demonstrate how different is Bob Cornuke’s map of Urartu shown in the video, the Piotrovsky map of Urartu had to be completely re-drawn (outlined in blue) in order to add entire areas of landmass to take into account Cornuke’s view of Urartu (outlined in red and adapted from the locations shown on the video into a new map). Cornuke literally leaves out 36,500 square miles of the accepted archaeologist’s view of Urartu. In addition, it should be noted that Cornuke adds about 28,000 square miles of geographical area to his map of Urartu with no archaeological support whatsoever, allowing his map to include some of the northern and central Elburz Mountains close to Mount Suleiman. When people talk about the boundaries of Urartu — which is the Assyrian designation, Armenia, [the] more modern designation — They can’t be precise. There is not a boundary that you can draw a line around. It expanded and contracted up to a thousand [1,000] miles based on war, or famine, or some kind of drought, very mercurial in the boundaries. So we can say it’s just right in that area of Turkey, the area of Iran, the area maybe of Azerbaijan. It’s just right in that area of the world; we just can’t be precise where in the area when we are talking about Iran. It’s right where the Bible indicates it should be [12 min. :30 sec.-13 min. :08 sec. into the video]. However, in the video, a speculative map of Ararat/Urartu graphic is shown that includes Mount Sabalan and comes close to Mount Suleiman. 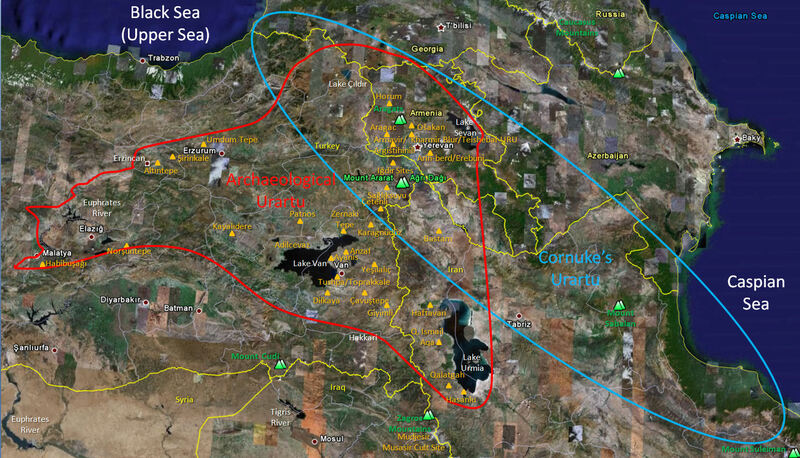 Cornuke knows he must have the Land of Ararat/Urartu extend all the way over to the Elburz mountain range in order to give his discovery any kind of credibility. It is our judgment that this graphic is very inaccurate and deceptive. As noted earlier, this map does not even include the known historical capital and cultural center of Ararat/Urartu at Lake Van, nor does it include the Gordyene Mountains south of Van, the large Urartean site of Hakkari, nor any of Turkey or the traditional Hurrian highlands extending west to Erzincan. However, it does conveniently extend south to the central Elburz Mountains and the edge of Mount Suleiman where not one piece of evidence for Urartian presence has ever been found. Urartian kings would have ruled all of the agricultural lands around Lake Van and Lake Sevan, and the southwestern shore of Lake Urumiyeh. The upper Aras, particularly the Armavir and Erevan areas, was firmly in their hands, and conquest took them as far north as Lake Cildir. Along the Murat, evidence for royal control is surprisingly meager, but sufficient to put the Euphrates at Izoli within the conquered zone and the Elazig area in the narrower sphere. Campaign inscriptions are found well to the east of Tabriz, but the nearest evidence for firm state control in that direction comes from Bastam, thirty-eight kilometers north of Khvoy. Missing from this picture are the large and fertile plains of Erzurum and Erzincan on the Karasu, the northwest shore of Lake Urumiyeh, the plain of Marand, and the middle Aras from Jolfa to the slopes of Mount Ararat. All of these are generally assumed to be part of Urartu in some sense, and it is worth examining other forms of evidence to see if there might be some grounds for including them within the perimeter of state control (1985: 10). Zimansky does not include the Elburz Mountains in the area of Urartu! Thus, it is NOT, as Mr. Cornuke claims, right where the Bible indicates it should be! There is a third reason why we believe that Cornuke is wrong. The Genesis 11:1 and 2 passage is too weak an argument to use as a place reference. The passage states: “And the whole earth was of one language, and of one speech. And it came to pass, as they journeyed from the east, that they found a plain in the land of Shinar; and they dwelt there” (KJV). The argument goes like this: If you translate the Hebrew miqqedem mdqm as: from the east, as the KJV does, it would clearly seem to indicate that the Ark must have landed somewhere to the east of historic Shinar (Mesopotamia), in modern-day Iran since it is that country that is directly east of Shinar. However, if you translate the miqqedem as eastward, as the NIV does, then you have the migration coming from the west toward Shinar. Elsewhere the miqqedem is translated in the east (NEB), that is: men moved in the east, then, the directional point is much more indefinite. Given that this migration occurred several hundred years after the disembarking from the Ark from the previous context of chapter 10, it seems best not to push this passage too much. Wenham favors in the east when the miqqedem is used adverbially as in 2:8; 12:8; and Isa. 9:12 (1991: 238). In addition, Mathews believes miqqedem marks events of separation, so it can also have a metaphorical sense (1996:1:478). If you do select the more specific, directional interpretation as Cornuke does (as in the KJV), and you believe the Ark landed in northern Iran, or northeast Turkey, it would have certainly been more accurate for the writer to say they migrated from the north east. Neither the Elburz Mountains, nor Mount Ararat is directly east of Shinar. The Biblical mountains of Ararat (Urartu) are directly north of the plain of Shinar. The apparent conflict between 8:4 and 11:2 is more easily resolved with a more indefinite interpretation in our opinion. It should also be pointed out that that there is least a 100-300 years period between the landing of the Ark after the Flood (Gen. 8), and the Tower of Babel event (Gen. 11). The peoples could have easily moved from where the Ark landed to other locations east or west of Shinar [Babylonia] before the Tower of Babel story took place. Fourth, one of Cornuke’s experts in the video, Frank Turek, briefly discusses the ancient sources. Unfortunately the editing in the video is bad at this point. Only the last part of a longer statement about Josephus and Nicolas of Damascus is given that seems to suggest that Ararat/Urartu extended further east than previously thought. Let’s examine one passage in Josephus. In Antiquities of the Jews 20:24, 25 (LCL 10:15), Josephus recounts the story of Monobazus, the king of Adiabene and the husband of Queen Helena, who wanted to see his son Izates before he died. The capital of Adiabene was Arbela in northern Mesopotamia (present day Iraq). When Monobazus saw his son, he gave Izates the district of Carron. The land of Carron is described as a place with “excellent soil for the production of amomum in the greatest abundance; it also possesses the remains of the ark in which report has it that Noah was saved from the flood, remains which to this day are shown to those who are curious to see them.” The land of Carron must be in the mountains just to the north of Mesopotamia. These mountains would be in present day southeastern Turkey, but they were never considered to be part of what is now present day Iran! The fifth line of argument may be the weakest of all. In the video there are claims that the rock that was brought back from Mount Suleiman was petrified wood and that it contained animal hairs of various kinds, bird follicles, savannah grass, seeds, insects, and other such things. This material should have been published first in a scientific peer-reviewed publication, either archaeological or geological, so that the scholarly community could see the documented evidence and analyze it. The reviewers seriously doubt that this rock outcrop is anything but a solidified volcanic lava extrusion. This can look exactly like petrified wood in the way it fractures and can even have cellular structures when seen under a microscope. The viewer should be very careful about taking this evidence at face value until further documentation is available. For a discussion of the geology of Mount Suleiman, see: Gansser and Huber 1962: 583-630. On the sleeve of the video case it states that this video is a Dove Family Approved documentary. It is our opinion that this should not have been approved because the video is deceptive in its presentation of the facts, i.e. the map with the supposed boundaries of Urartu. In addition, it is factually inaccurate and based on a questionable eye-witness. Also, in the credits at the end of the video one of the authors of this article (Bill Crouse) is listed as an advisor. This was not authorized and he in no way wishes it to be seen as an endorsement of the material. We have also noted how carefully at times statements are worded in the video. On the cover of the video box and the beginning of the video, they build up the fact that they are looking for Noah’s Ark. By the end of the video, they don’t claim they were looking for Noah’s Ark, but rather the Ed Davis object. One wonders if this is a very clever change in case somebody challenges the content of the video. Our opinion is that they have found neither. We would caution those who read this: If you are considering forwarding this review to another Christian who is enthused about this so-called discovery, as well as others from the BASE Institute, we pray that you do it with a sensitive and kind spirit. It might be good to preface the review with a question: Have you considered, or would you be interested in reading a different perspective about these discoveries? In this review we want it to be perfectly clear that in no way is this review personal, either about Bob Cornuke, or anyone who appears in the video. Our sole concern, at this point, is to review the information and make informed comments. If it was the motive of the producers to instill confidence among believers that the Bible is true this sets a poor precedent, and could have the opposite result. Even worse it is a poor testimony to unbelievers. 1999 The Explorers of Ararat: And the Search for Noah’s Ark. 2nd ed. Highland Ranch, CO: Great Commission Illustrated Books. 2005 Ark Fever. The True Story of One Man’s Search for Noah’s Ark. Wheaton, IL: Tyndale House. 2001 In Search of the Lost Mountains of Noah. The Discovery of the REAL Mountains of Ararat. Nashville, TN: Broadman and Holman. 1988 Is the Ark in the Ahora Gorge? Ararat Report #14 (Jan.-Feb.). 1989 The Ed Davis Testimony: An Addendum. Ararat Report #20 (Jan.-Feb.). 1993 Modern Eyewitnesses: Are They Reliable? Ararat Report #32 (May). 1962 Geological Observations in the Central Elburz, Iran. Schweizerische Mineralogische und Petrographische Mitteilungen 42: 583-630. 2006 Mount Ararat Archaeological Survey. Bible and Spade 21/3: 70-96. 1965 Antiquities of the Jews. Book 20. Vol. 10. Trans. by L. H. Feldman. Cambridge, MA: Harvard University. Loeb Classical Library 456. Reprinted 1981. 1996 Genesis. Vol. 1. Nashville, TN: Broadman and Holman. 1969 The Ancient Civilization of Urartu: An Archaeological Adventure. Trans. by James Hogarth, from Russian. New York: Cowles Book. 1839 Notes on a March from Zohab, at the Foot of Zagros, along the Mountains to Khuzistan (Susiana), and from Thence Through the Province of Luristan to Kirmanshah, in the Year 1836. Journal of the Royal Geographical Society of London 9: 26-116. 1986 The Painful Mountain. Fresno, CA: Pioneer. 1991 Word Biblical Commentary. Genesis 1-15. Vol. 1. Milton Keynes, England: Word (UK). 1985 Ecology and Empire: The Structure of Urartian State, Chicago: University of Chicago. 1998 Ancient Ararat: A Handbook of Urartian Studies. Delmar, NY: Caravan Books. This entry was posted in Archaeology. Bookmark the permalink.